The courses of lighter colored brick found in this brick pad represent foundations uncovered while preparing the area for construction. The walls were part of the main arsenal building which was started in 1838 and completed in fall of 1839. The building was used as a storage facility for small arms, rifles and muskets. Location. 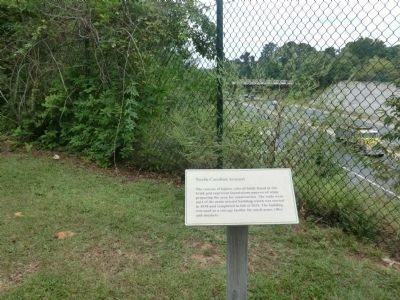 35° 3.252′ N, 78° 53.616′ W. Marker is in Fayetteville, North Carolina, in Cumberland County. Marker can be reached from Arsenal Avenue west of Bradford Avenue, on the left when traveling west. Touch for map. 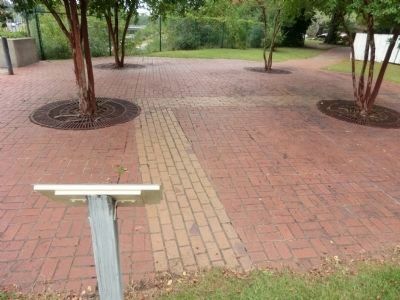 The marker is on the grounds of the U.S. Arsenal-Museum of Cape Fear Historical Complex. Marker is at or near this postal address: 801 Arsenal Avenue, Fayetteville NC 28301, United States of America. Touch for directions. marker); The "Ghost" Tower (about 300 feet away, measured in a direct line); 1897 Poe House (about 300 feet away); Gun Carriage and Turning Shop (1842 - 1849) (about 300 feet away); Arsenal (about 300 feet away). Touch for a list and map of all markers in Fayetteville. More. 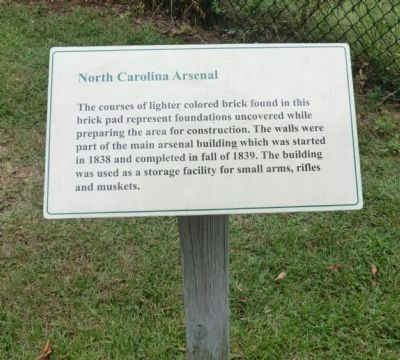 Search the internet for North Carolina Arsenal. Credits. This page was last revised on June 16, 2016. This page originally submitted on November 22, 2013, by Don Morfe of Baltimore, Maryland. This page has been viewed 270 times since then and 3 times this year. Photos: 1, 2, 3. submitted on November 22, 2013, by Don Morfe of Baltimore, Maryland. • Bernard Fisher was the editor who published this page.